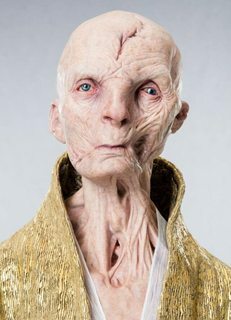 Do we have any canon description of whether Snoke is human or not? He certainly appears to be simply a disfigured human, tall in stature. Yet Wookieepedia describes him as "Force-sensitive humanoid alien". If this is right, what exactly is canon reference which tell us he is non-human? First of all, as is often the case, Wikia is WRONG, when it says "Force-sensitive humanoid alien". This is clear when you dig into the article, where they explain why it's worded thusly: "Snoke was a humanoid alien who was leader of the Attendants, a retinue composed of mute alien navigators who originated from the Unknown Regions". For some unknown reason, whoever wrote the Wikia article you linked to misinterpreted that to be an info about Snoke himself. Just to unequivocally prove that Snoke isn't one of the same race as Attendants, Visual Dictionary says this of their bodies: "robes conceal segmented, chitinous plates". They sound insectoid. Second, we don't have almost any specific information on who and what Snoke is (covered in detail in my answer here: "Is there evidence to suggest that Supreme Leader Snoke is Darth Plagueis?" - I posted a very extensive answer there that doesn't merely cover Plagueis angle but pretty much everything we know, or rather don't know, about Snoke). Seated on the raised platform that was the focus of the chamber was the blue-tinted holo of Supreme Leader Snoke. Tall and gaunt, he was humanoid but not human. Seated in shadow, the tall, slender form loomed over the other two men. That might be interpreted as Snoke not being human. But on the other hand "the other two men" line can also be interpreted that he is, and bolded text merely describes his appearance (similar to how Emperor Palpatine and Lord Voldemort didn't really look very human after their "magical evil transformation"). Additional context: on top of the quote being possible to interpret different ways Foster's novelization was based on early TFA draft, and might not even have latest correct canon info (as was the case with some other details such as mechanics of how Starkiller base worked). Not the answer you're looking for? Browse other questions tagged star-wars the-force-awakens the-last-jedi snoke humanoid or ask your own question. What did Luke do to Jabba's guards? Why does Snoke not cover his face? Who is Snoke and how did he come to power?